I now have Complete Fairy Garden Kits available on my etsy shop. My husband and I have been enjoying making papercrete pots from recycled paper and cement. We have created a few special sizes for the etsy shop and have experimented with quite a few other sizes for art shows. 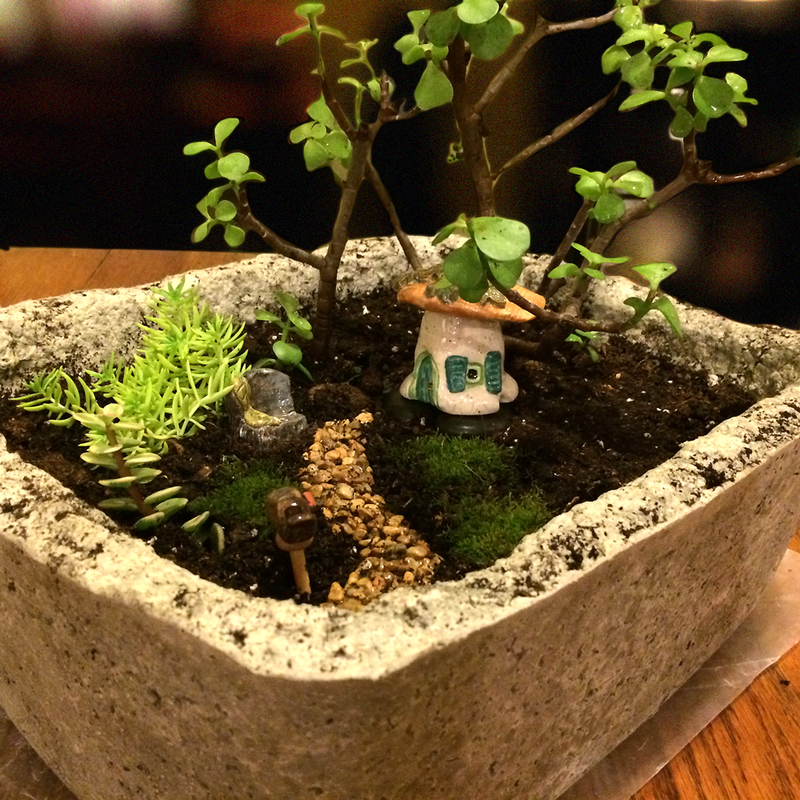 The kit comes with the papercrete container, a fairy garden mushroom house, a bench, stone pathway, and a tiny fairy garden mailbox! Plants and soil are for the customer to add, but everything else is there for a unique and adorable little garden. I have created some sample gardens to show how they look once they are put together. I am having way too much fun! Of course, I have quite a nice collection of plants that look great in a miniature or fairy garden. A new favorite is Angelina Sedum. In the second photo you can see the bright yellow-green plant on the left of the container. Its leaves are fine and small, perfect for my fairy garden. The color adds a nice brightness next to my moss and miniature Jade “tree”. As the moss grows it will fill in to look more like grass. I will keep the plants well trimmed to remain small and keep the look of the miniature space. Stop by my shop to see what is new. 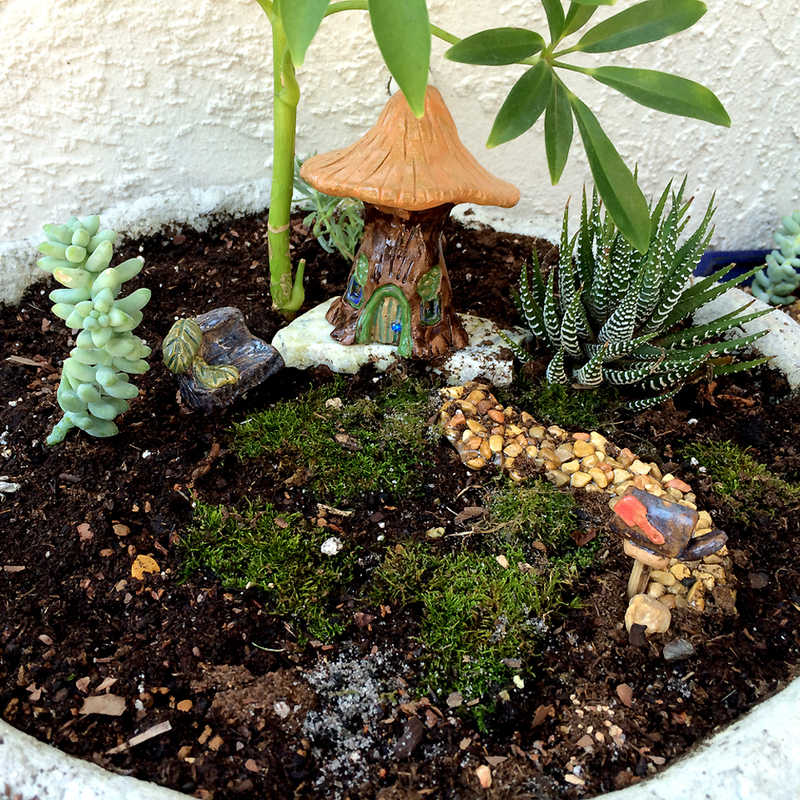 If you have a fairy garden—indoor or outdoor—please contact me to share your photos and story. Your little garden may inspire others and we can all celebrate when we view each others creativity.